You can often score significant discounts by booking a flight and hotel together. However, many travel providers also allow you to redeem points or miles for these packages. While these aren’t always a great deal, they can definitely provide some solid value when you use them properly. Today, TPG Senior Points & Miles Contributor Nick Ewen continues our series examining these programs. After covering Marriott Rewards’ Hotel + Air Packages, he turns his attention to SPG’s . SPG’s Nights & Flights packages can be a great deal, but they unfortunately only extend to Category 3 and 4 properties (like the Convento do Espinheiro in Portugal). What’s interesting is that the SPG website actually claims the savings are 18,000 points and 20,000 points at Category 3 and Category 4 properties, respectively. However, that doesn’t take into account the fifth night free that SPG provides to members when they redeem points for stays of five nights or longer. You’re still saving 8,000-10,000 points, which equates to $200-$250 (based on TPG’s most recent valuations). Total Package Price – Standard Redemption Cost = Cost (in SPG points) of purchasing the airline points/miles. The additional Starpoints above the standard cost for a five-night award stay are basically being used to purchase the 50,000 airline miles. You’ll need to answer a simple question: Is it worth spending the extra Starpoints to get the airline points/miles, or should you just redeem the points for the five-night stay and keep the rest for future redemptions? In other words, when are the airline points or miles you receive worth more than the additional Starpoints required? As you’ll see, there are times when it makes sense to pull the trigger and other times when you should stick with a standard award stay and ignore these Nights & Flights packages — and it all depends on how you value both SPG points and your chosen airline’s currency. For the purposes of my analysis, I will use TPG’s most recent valuations to calculate when it makes sense to book these packages for each of the 16 airlines he includes on the list. Enjoy an alpine-inspired stay at the Category 3 Sheraton Fuschlsee outside of Salzburg. As mentioned above, when you book a Category 3 Nights & Flights package, you’re essentially paying an extra 32,000 Starpoints to earn 50,000 miles. These Starpoints are worth a whopping $800 and are good for a one-night stay in a luxurious top-tier property like the St. Regis Bal Harbour. As a result, the 50,000 airline miles you receive should be worth at least that amount in order to utilize this redemption. As you can see, there are only a few cases where these packages make sense from a break-even standpoint (and a couple where you will break exactly even). This makes sense, given the fact that you can take advantage of valuable redemptions on both Alaska and American. Because you’re getting a better ratio of of Starpoints to airline miles/points, the break-even point drops a bit, so you’ll have additional airline currencies that either now make sense or are at least evenly matched. Of course, taking a look at the monetary value of the points you’re redeeming and the miles you’re receiving is just one part of the puzzle. There are two other key considerations when it comes to booking a Nights & Flights package with Starwood Preferred Guest. In the above analysis, I used TPG’s valuations to quantify how much your 50,000 miles are worth. 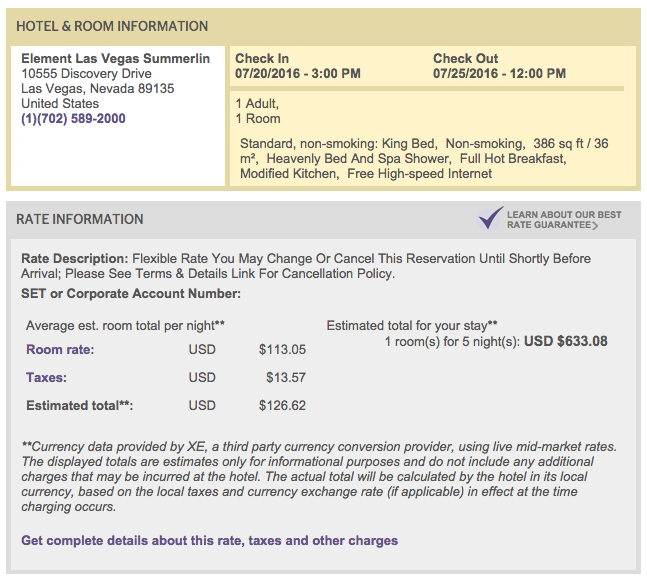 However, this ignored the fact that you might not be getting solid value out of the actual hotel stay. TPG pegs Starpoints at 2.5 cents apiece, the highest of any hotel and airline program out there. While you can definitely get more value out of your points (my recent award redemption at the Equinox Resort & Spa actually gave me a value of almost 8 cents per point! ), there are also times when it doesn’t make sense to use your points, either because the property isn’t luxurious enough or the revenue rates are so low that you should just pay for the stay. In this case, redeeming 40,000 Starpoints for a five-night stay would only give you a value of 1.58 cents per point. It’s essential to check the property to make sure it’s a solid use of points. The other big aspect of the Nights & Flights package to consider is availability. The hotel side of things is relatively straightforward – the property either has a room using points or it doesn’t. You can use SPG.com to search this award inventory. Any hotel that shows a standard award available should be bookable through Nights & Flights. The much more challenging aspect is finding and utilizing award inventory on your flights. In an ideal world, you would book one of these packages, receive 50,000 airline miles/points and immediately lock in your desired flights on your desired dates. The reality is that availability for airline award tickets is far from a science and in some cases is essentially non-existent. Emirates first class is one award available on ExpertFlyer. Fortunately, there are some methods that will help in this search, and my personal favorite is ExpertFlyer. This allows you to search for award inventory on numerous airlines, including the vast majority of SPG transfer partners. For more information, check out my post on how ExpertFlyer alerts can help you find award availability. When it comes to SPG’s Nights & Flights packages, there are a few key restrictions. For starters, they’re limited to Category 3 and 4 properties. This rules out all of the properties I included on my list of nine SPG properties that make for awesome award redemptions, but a few from my list of top low-tier redemptions fall within these two categories. In fact, you’ll have more than 650 properties to choose from across all nine of SPG’s brands, representing over half of the program’s entire portfolio. These can only be booked by calling SPG, just like when you want to redeem Starpoints for a suite. You must order these awards at least 14 business days prior to the start of your stay for US airlines and at least 30 business days prior to arrival for non-US airlines. This allows time for processing of the airline award. If you cancel, you’ll only receive part of the Starpoints that you spent back: 20,000 points for Category 3 and 30,000 for Category 4. However, the airline miles/points you receive are final and cannot be changed. This (in essence) wipes out any savings you would get from booking these packages. If these packages are appealing to you, there are several ways to quickly rack up the necessary Starpoints. For starters, consider signing up for the Starwood Preferred Guest Credit Card from American Express, which is currently offering a sign-up bonus of 25,000 points after you use your new card to make $3,000 in purchases within the first three months. This isn’t as lucrative as the 30,000-point offer from the summer, but the card does include several nice benefits, such as credits toward elite status, no foreign transaction fees and Boingo wireless access. The Palacio del Inka is a Category 4 property in Cusco, Peru that can be a great option for the Nights & Flights package. SPG’s Nights & Flights packages can be a great option if you’re planning a trip to a Category 3 or 4 property. However, be sure to crunch the numbers before deciding which package makes the most sense – or whether to pull the trigger at all! It would be nice if these were eventually expanded to higher categories, but when you factor in the plethora of ways to redeem the miles you’d receive, these packages can open up a world of travel. Have any of you booked a Nights & Flights package with SPG in the past?